Last time I wrote was just before Christmas...of 2010! Been a while. Time waits for no man. For all those people we met and filmed on our way across the US and back, and all those who followed our trip, you'll be glad to know we're back at work on the documentary. King of the Road is well into editing now. Looking good, too. This morning Jay and I got together with Alex and his son Curtis for bacon and eggs at the Gold Range in Yellowknife. I sat across from Alex who told stories and made sure the rest of us are staying on track. I'm married now, so he can't give me heck anymore about living in sin. But he's still darn sure that he's right and everyone else needs advice. It's mid-summer and been over 30 degrees this week. 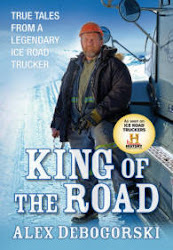 The heat is pretty tough on those of us built for the cold, and certainly hard on an ice road trucker. So Alex's truck is parked and he's driving his off-season vehicle. It's no golf cart. Similar to the way Alex's laugh is tough to miss, his car turns heads when it rolls down Yellowknife's Franklin Ave. Especially this morning with Alex, Jay and I all crammed into the front seat for a drive through town (who knows what's gone on in the back seat!?). Here's a quick iphone video Jay and I put together of Alex and his "rat rod" Cadillac. Enjoy. And stay in touch to see when the doc comes out. More soon.